Stone Family 1900: standing – Chauncey Stone, Charl Parsons, Mary Melling Stone, John Stone, Jessie Mills Stone holding baby Wilford, Peter Stone, Grandma Ellen Knowles Melling Salisbury, Sarah Stone Brown, Mary Ellen Salisbury Parsons; sitting – Carl Stone, George Parsons, Anne Parsons, Darhl Brown, Violet Brown, Ruby Parsons; photo by Arthur Parsons c. 1900. 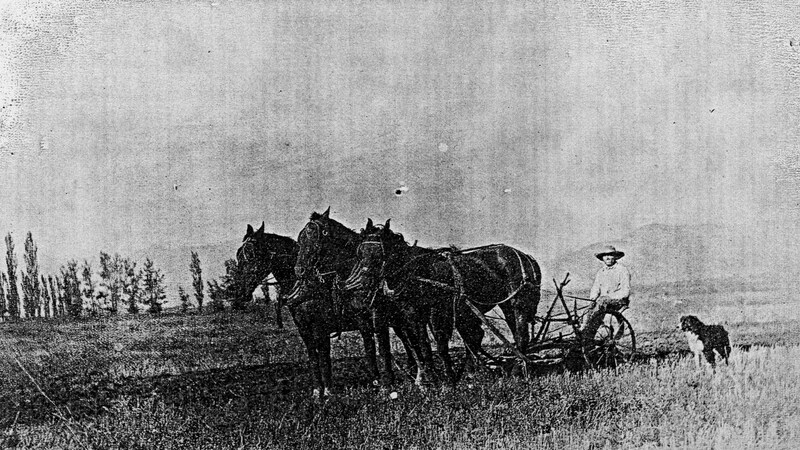 Chauncey Stone plowing c. 1910. 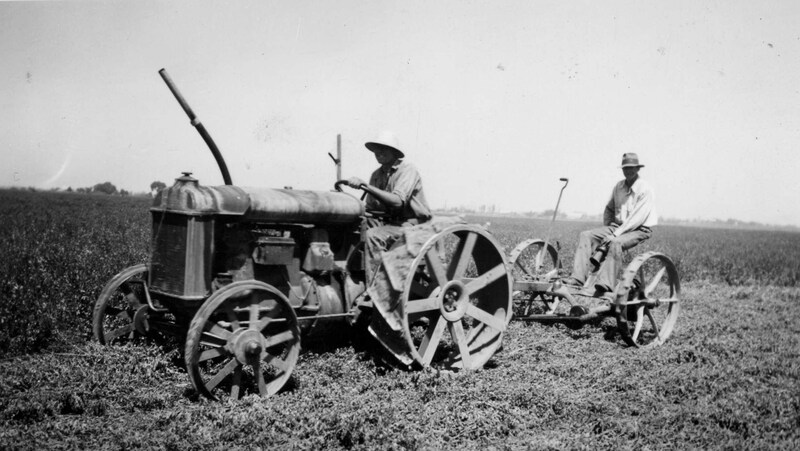 Warren Stone and Chet Jenkins on Massey Fergeson Type A; Stone Farm typified the transition from horse drawn plows to gas powered machinery; photo by Helmer “Tug” Anderson, c. 1936. In 1913 James and Mary Melling Stone’s sons, John and Chauncey, born 1875 and 1880, became partners and expanded Stone Farm, purchasing the 90 acre Bingham farm. The Stone brothers were taught agriculture by their father and uncles, and they continued in this vocation all of their lives. 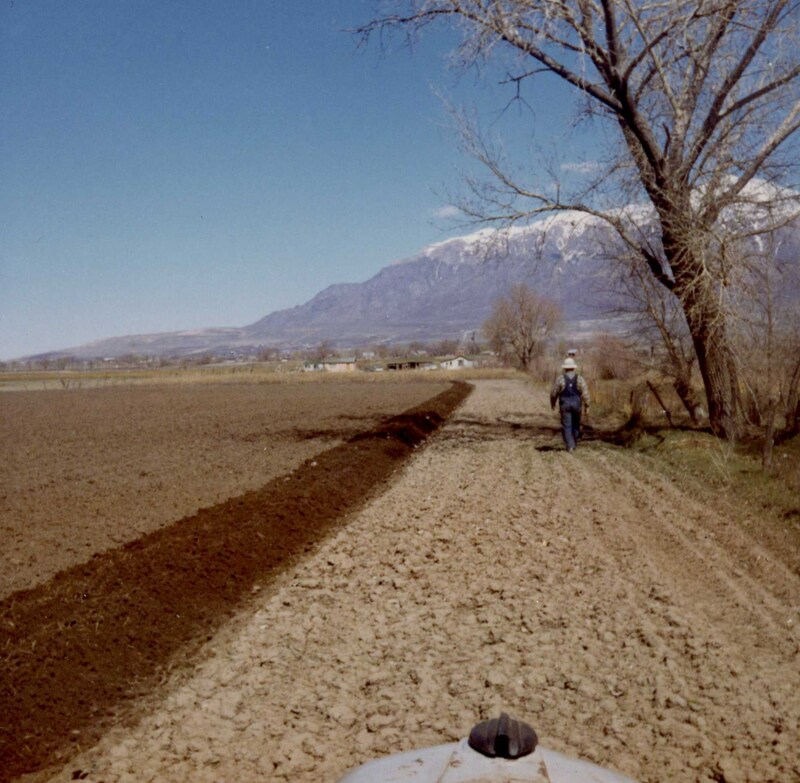 At its peak, Stone Farm was 190 acres and the Stone brothers were mainstream Utah farmers at a time when agriculture was a major contribution to the economics of Weber County. 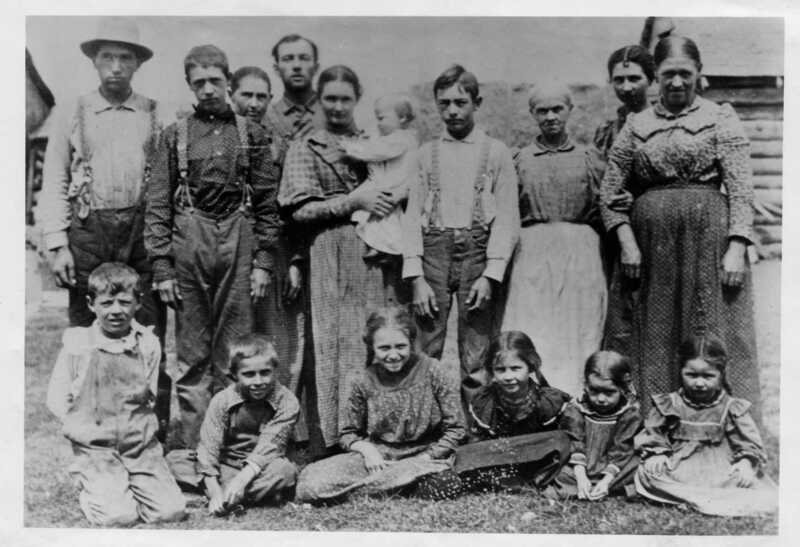 Diversified farming was typical throughout the state and helped to stabilize income. Cash crops on Stone farm were sugar beets, milk and dairy products, garden crops, and wheat. Lucerne was grown to feed their animals. During the twentieth century, those living at Five Points knew lower West 2nd Street as Stone Farm. Stone Farm 1967, Harvey Stone.